At Lentz Eye Care, we believe that our continued success is a direct result of adhering to our three guiding principles: Technology, Quality and Service. The integration and use of advanced technology is an important part of what separates us from other optometric clinics. In our eye exams we make use of the latest diagnostic technology, including Optos Laser Retinal Scanning, Macular Pigment Density Scanning, Specular Microscopy and OCT. This allows us to detect developing eye conditions earlier and with a greater degree of accuracy than what is possible without these technologies. Our focus on technology extends beyond eye exams. We offer the latest eyeglass frames and lenses, including eyeglass lenses that filter out harmful blue light. You will also find a large selection of contact lenses including – toric, multifocal and specialty lenses. Great care is taken with each and every pair of glasses and sunglasses purchased from Lentz Eye Care to insure maximization of each patient’s vision. Quality starts with using only the highest quality lens blanks, we never use factory seconds or discontinued styles. We control each step of the process with our doctors communicating directly with one of our experienced and knowledgeable opticians who then speak directly with the lab technicians in our in-house optical lab to discuss all aspects of the patient’s prescription to optimize the finished product. We stand behind each pair of spectacles sold and guarantee your complete satisfaction. 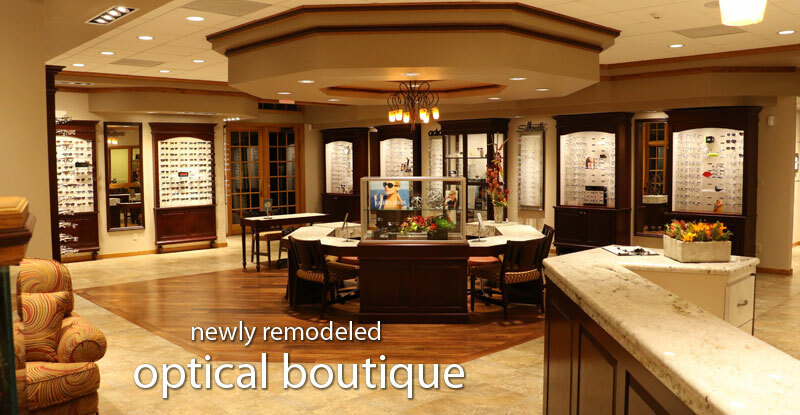 At Lentz Eye Care great service starts the moment that you contact us. From your first check in to your latest visit, you can count on consistently excellent and professional service. You will always be greeted by a warm friendly smile, and made to feel at home throughout your entire visit by all staff and doctors in our clean comfortable offices. Each of our three offices has early morning and evening appointment times available to accommodate your busy schedules. We know how valuable your time is and work hard to minimize wait times and operate efficiently to ensure your appointments are quick and convenient.